My hunch is that most Americans need a break right now. Turn off the news, forget the economy and spend a little time with friends and family. The enjoyment of wine and food fits right into this, which is exactly the spirit of our Vintner's Select Wine Club. Started over 20 year ago with just a handful of friends, it has now grown to over 3500 die hard Dry Creek fans who share one thing in common: a love of wines and a desire to share in our family's heritage. 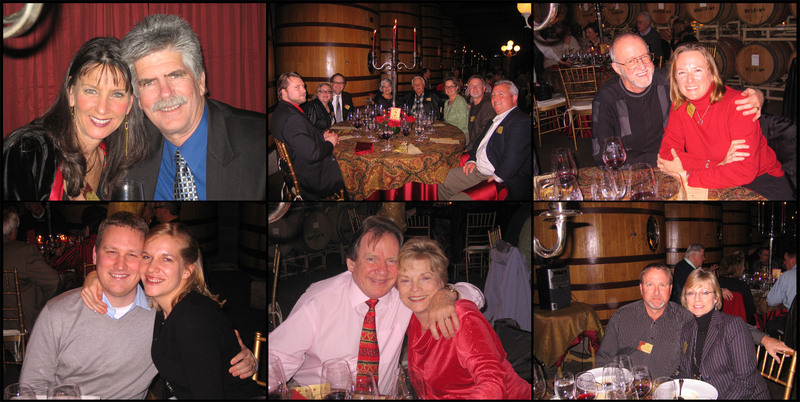 With that in mind, Valentine's Day was the perfect night for 60 wine club members and their guests to join us for an aphrodisiac-inspired feast in the winery's cellar. The menu included such enticing delectables as oysters, lobster, porcini mushrooms, Kobe beef, and Grand Marnier crème brulée. People came from as far away as Florida and Maryland to wine, dine and laugh among new and old friends. One couple, Kym and John Markley, even celebrated their 17th wedding anniversary. All in all, it was a lovely way to spend Cupid's eve and an important reminder of the rejuvenating qualities of laughter and merriment during these uncertain times. Many thanks to all who attended! "My hunch is that most Americans need a break right now. Turn off the news, forget the economy and spend a little time with friends and family." Thanks John and Stu for posting your comments. I think we are all craving a connection with friends and family right now. Wine brings people together, makes mealtimes more enjoyable, and is a fun and interesting distraction from the daily stress and strain people are faced with. Thanks for including our wines in your lives gentlemen! Thanks again Kim and Don for a magical evening. We certainly look happy in our photo don't we. This page contains a single entry by Kim published on February 20, 2009 1:58 PM. The Heroes of Our Industry was the previous entry in this blog. It's Election Time (Again) is the next entry in this blog.